Abortion is still a taboo: The topic is annoying, polarizing, stigmatizing, and even criminalizes women. Media coverage on abortion represents a one-sided visual language for a simple reason: Little to no useful stock photo material is available to depict the reality of this part of life. Therefore, MUVS Vienna is reaching out to obtain photographs that illustrate the critical situation of a woman (or couple) with an unwanted pregnancy in a realistic way. Photographers are invited to grapple with the difficult topic of unwanted pregnancy and abortion in a creative way. 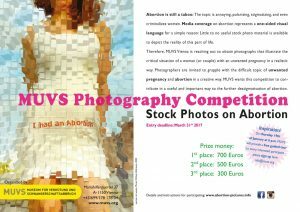 MUVS wants this competition to con- tribute in a useful and important way to the further destigmatisation of abortion.